For the studio album by American thrash metal band Overkill, see Ironbound (album). Ironbound is an unincorporated community and neighborhood within the city of Newark in Essex County, New Jersey, United States. It is a large working-class, close-knit, multi-ethnic community covering approximately four square miles (10 km²). Historically, the area was called "Dutch Neck," "Down Neck," or simply "the Neck," due to the appearance of the curve of the Passaic River. The Ironbound is part of Newark's East Ward and is directly east of Newark Penn Station and Downtown Newark, and south and west of the river, over which passes the Jackson Street Bridge, connecting to Harrison and Kearny. The name "The Ironbound" is said to derive from the large metalworking industry in the area or from the network of railroad tracks that surrounded the neighborhood. The Ironbound was an industrial neighborhood in the 19th and early 20th centuries. Workers at Benjamin Moore paints, Ballantine Beer, the Murphy Varnish Company and Conmar Zippers lived next to railroad and port workers. The neighborhood was also home to Hensler's Beer Brewery and Pride of Newark ("P.O.N.") beer by the Feigenspan Brewery. The Ironbound was poorer than was the rest of Newark at that time. A legacy of that 19th century poverty can be seen in the neighborhood's architecture - there are very few brownstones or even brick-faced buildings in the district. The inhabitants were considered to be in such need of help that Protestant reformers established the Bethel Mission there in 1850. Today however the Ironbound is one of the more affluent neighborhoods in Newark. As it does today, the Ironbound had inhabitants of many ethnic groups in the 19th century, with Germans, Lithuanians, Italians and Poles being prominent. Lithuanians built the Sacred Heart of Jesus Church in 1894 and Trinity Church in 1902. St. Casimir's Church was founded under Polish auspices in 1908. As an example of the size of the German community in the Ironbound, prior to World War I, Wilson Avenue was called Hamburg Place. Saloons were major meeting places for Ironbound workers in the era before radio and television. A 1912 survey found 122 saloons in the neighborhood. "The men, after eating a hasty supper in a dirty, crowded home or boarding house," a social worker noted, "quite naturally leave such unattractive surroundings to spend the evenings playing cards and drinking in a warm, well lighted saloon." The Ironbound had a large African American population in the mid-Twentieth Century. Locally famous jazz singer Miss Rhapsody was born in the Ironbound. Sarah Vaughan grew up in Lincoln Park, but attended church at the Mt. Zion Baptist Church on Thomas Street. In 1983, dangerous levels of dioxin were discovered at an abandoned chemical factory in the Ironbound. The Diamond Alkali Company was largely responsible for this pollution through their heavy production of Agent Orange between 1951 and 1969. The off-site cleanup was completed by 1986, and in 1989 the site received a permanent impermeable cap. Today, the Ironbound is known for being a Portuguese neighborhood. Portuguese roots in the area run deep, with the first immigrants having arrived in the 1910s. By 1921 there was a large enough Portuguese population to found Sport Club Portuguese, the first of over twenty Portuguese social clubs that would call the Ironbound home. Every year, people flock to the annual Portuguese Festival, known as Portugal Day, "Dia de Portugal" (typically held the first or second weekend in June), an enormous celebration of Portuguese culture which attracts nearly half a million people, almost double the population of all of Newark. Galician Spanish immigrants also settled in the Ironbound. In the 1930s Spanish Catholics built elaborated catacombs underneath the Church of the Immaculate Heart of Mary. In the underground catacombs are placed lifelike wax effigies of saints and martyrs, as there are no burials there. The walls, ceilings and floors of the catacombs are decorated with mosaics and murals. The church above the catacombs was built in the 1850s for a German Baptist congregation, an example of ethnic succession. Many houses and apartments in the Ironbound are embellished with elaborate azulejos. 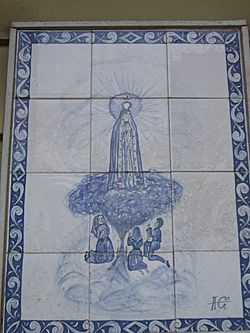 One common icon is Our Lady of Fatima, seen here. The great influx of Portuguese came in the latter part of the 1950s. Today, immigration from Portugal is practically nonexistent, but the Lusophone (Portuguese-speaking) population is stable thanks largely to immigration from Brazil and several Lusophone countries in Africa, especially Cape Verde. There is the Portugal Day festival every June and a Brazilian festival in September. Brazilians and Portuguese are joined by immigrants from Ecuador and Mexico and a growing non-immigrant community working in New York City or Downtown Newark. The Brazilians have brought churrascaria restaurants, and schools for capoeira and samba music, to the neighborhood. The first capoeira academy in Newark, New Jersey Capoeira Arts Center, was founded by Mestre Cigano of Grupo Liberdade de Capoeira in 1996. The Portuguese-language newspapers 24horas Portuguese Daily Newspaper, Brazilian Voice, Brazilian Press and Luso-Americano are published here. The Ironbound avoided the economic decline of most of the rest of Newark for several reasons. First, the Ironbound was spared highway construction. Rather than going through the neighborhood, highways, such as Interstate 78 and the New Jersey Turnpike, went around it. The Ironbound did see some public housing construction, but it was low-rise and consistent with the fabric of the neighborhood, rather than the high-rise housing projects built elsewhere in the city. Finally, the qualities of immigrant merchants, such as the Portuguese, should be given credit for the Ironbound's preservation. Many Portuguese-owned businesses— restaurants, cafes, bakeries, jewelers, sports clubs, grocery stores and more— line or surround Ferry Street. In particular, the neighborhood is often visited by both Portuguese and non-Portuguese for its many well-known Portuguese, Spanish and Brazilian restaurants. Additionally, the Ironbound has an active night life and an increasing variety of bars and cocktail lounges. The Ironbound is one of Newark's most vibrant neighborhoods. There are almost no vacant stores along Ferry Street, its commercial heart. The neighborhood has a mix of different home styles, from apartments in multifamily dwellings to single-family houses on small lots to two family homes. Many old industrial sites have been converted to modern detached townhouses. 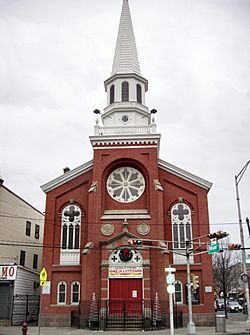 St. Stephan's Church is an Ironbound landmark. Built in 1874 for a German-speaking congregation, which it remained until the 1930s, the church is still Lutheran but uses Spanish and Portuguese in its services. The architect was George Staehlin and the interior has some of the most ornate woodwork in Newark. The church is shown as the first alien spawning point in Steven Spielberg's War of the Worlds. Locals call this site "As Cinco Esquinas/Five Corners." The Ironbound, 4 square miles (1,000 ha), is in the East Ward of Newark. Ironbound is east of Pennsylvania Station and is between the Newark Liberty International Airport and the Passaic River. 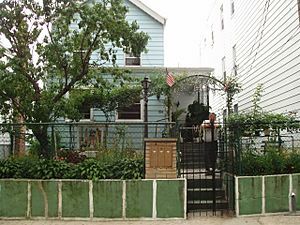 Arthur Rosa, president of local real estate firm Rosa Agency, said in 2004 that 60% of the housing in Ironbound consists of two and three family houses, 15% consists of single family houses, and the rest apartment buildings that each have four or more units. Riverbank Park, designed by Frederick Law Olmsted, is one of the few open spaces in the dense neighborhood. Singer-songwriter Suzanne Vega paid homage to this neighborhood in her 1987 song entitled "Ironbound/Fancy Poultry." The neighborhood was featured in the 2005 motion picture, War of the Worlds, in which director Steven Spielberg used special effects to destroy Five Corners and St. Stephen's Church. Jersey Shore singer-songwriter, John Padovano, aka "the Ironbound Crooner" was born in the Ironbound Section of Newark. His album The Return Of Rainy Day Hobo has a song entitled "Oliver Street" that is about his early childhood in the Ironbound. Tony Soprano grew up in Ironbound, as seen in Episode 7 of the first season of The Sopranos, "Down Neck". The beginning of The Karate Kid was filmed in the Ironbound. In the opening sequence of the Alfred Hitchcock thriller "Shadow of a Doubt" the neighborhood that the camera pans into where Joseph Cotton is hiding is the Ironbound. Ironbound has a counterpart in Alderney City in Grand Theft Auto IV, where a neighborhood called Leftwood appears to have a large Portuguese population including heritage and language deriving from Portugal. The popular Pages of Ferry Street literary reading series highlights Portuguese-American writers, with the first reading in June 2012 at the Sport Club Português, featuring Portuguese writer Jose Luis Peixoto and Ironbound born Carlos J. Queirós; In 2013, the Ferry Street reading included Paula Neves and Millicent Borges Accardi. Heavy metal band Overkill released their 15th album titled Ironbound in 2010. Much of the album's lyrical theme, especially the title track, surrounds the topic of the local area and its people. Poet Deborah Corona LaVeglia, who attended Lafayette St. School and East Side High School is author of "Vigil" and often writes about growing up in the Ironbound area. Ferry Street was named after the ferry that traveled between Newark and points east. In 1849, "The Newark Plank Road Company" was hired to fix the road with planks to provide a smoother form of travel. Ferry Street was then changed to "Plank Road." It was not completed within the 50-year charter that it was given to accomplish the work. A legal dispute occurred and the Hudson County section changed "Plank Road" to the Lincoln Highway while the Essex County section was changed back to "Ferry Street." Ferry Street and East Ferry Street were stations on the Newark and New York Railroad (a.k.a. the Newark Branch of the Jersey Central RR), which ran between the Broad Street terminal (also called Lafayette Street Terminal) and Communipaw Terminal, with a few daily trains to Elizabethport. Infrastructure for the route has been mostly removed, though portions of the bridge crossing the avenue remain. Today, Ferry Street is the home to many small business owners. Some of these small businesses have been running since the 1930s. Restaurants, mini markets and clothing stores well represented. Ferry Street is the location for the Portuguese festival during the month of June. During Portugal Day Weekend, many people come out to celebrate Portuguese-American culture. Ferry Street is also the location for most soccer fans to come and celebrate. Fans walk up and down the street while others decorate their cars and celebrate the victory of their soccer team. In September, there is also a Brazilian festival, although it does not always take place directly on Ferry Street. The night life is also of interest while people attend some of the bars that are located along the strip. Ferry Street is still well known throughout northern New Jersey and adds to Newark's popularity. In the twenty-first century, Ferry Street is the site of Portuguese, Spanish, Brazilian, Ecuadorian and Mexican restaurants and formerly a Cape Verdean club. Ironbound Facts for Kids. Kiddle Encyclopedia.